It was mixed up with Jack's DVDs.... odd. Anyway, this is Squiggle at the 28-29ish week growth scan. Baby's head is to the right, looking up and over to the left. 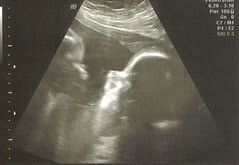 If you're good with scans you can make out the profile: forehead, nose, lips & chin.